CEDAR CITY, Utah, December 15, 2011 (ENS) – Utah wildlife officials estimate that about 1,500 eared grebes were killed late Monday night, when the birds crash landed in a storm on a Walmart parking lot and other open areas of Cedar City. An additional 3,500 confused grebes were rounded up through the night by hand by volunteers and staff of the Utah Department of Wildlife, and released into a nearby lake. It appears that a storm and associated cloud cover was a key factor in causing the birds’ confusion, as well as a shiny parking lot surface that may have looked like a water body in conditions of poor visibility. “Thousands of the birds went down. Some were killed, but we also rescued a bunch. Citizens were bringing them in from all over Cedar City,” Canning said Wednesday. According to American Bird Conservancy, based in Washington, DC, several traits of this bird likely played a role in this incident. Grebes are only able to land and take off from water so a shimmering parking lot on a stormy night may have looked like a natural landing area. 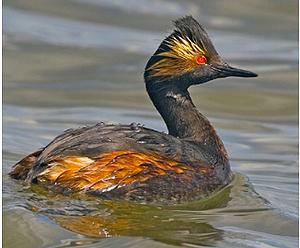 The eared grebe carries out the latest fall migration of any bird species in North America, putting it in this storm at a time when other migrating birds likely have already arrived at their southerly destinations. The eared grebe migrates only at night, which increases the risk of the bird getting confused by city lighting and cloud cover. “Large kills of night-migrating birds are unfortunately not unusual, and are generally related to man-made light sources – from spotlights to cell phone towers,” said Sheppard. “Even light from office windows, street lights, and decorative lighting can attract birds to land in cities, where they are at high risk of colliding with glass on buildings as they try to feed the next day. Reducing unnecessary lighting can reduce this type of mortality, but in the case of the grebes, we simply don’t know if they took tarmac for a body of water or lost orientation,” Sheppard said. Eared grebes are the most abundant grebe species in the world. The small waterbirds, measuring nine to 12 inches long, have a wingspan of about 23 inches. The birds eat aquatic insects and crustaceans, occasionally tadpoles, small frogs, and small fish. They breed in shallow wetlands in western North America. Eared grebes occur in greatest numbers on Mono Lake and the Great Salt Lake in fall, where the birds double their weight in preparation for a nonstop flight to their wintering grounds in the southwestern United States and Mexico.